The dog house project started as an art project with the goal of producing a dog house that could be put in the front yard without being an eye sore. 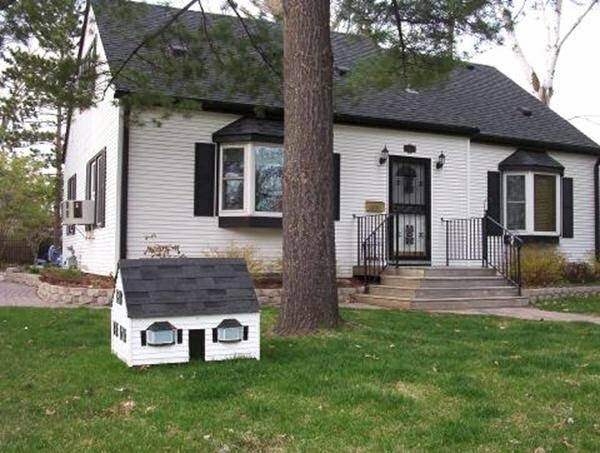 The initial plan was to produce a dog house that looked like the house. In making the dog house look like the house, I believe that I was quite successful. It did help that the dog house was built with left over supplies from home projects. The shingles are left over from the last time the house was re-roofed, and the dog house floor is a few extra slabs of Pergo from the kitchen remodel. The walls and roof are constructed from 3/4” plywood and the siding is from 1/4” plywood cut into strips. The plywood was all just old scraps. The only additional investment was in using A2C pressure treated 2X4 for the base, the 3/4” marine nails for a majority of the fasteners, some glue and trim pieces from a craft store and some paint. All together, the only real cost was time. 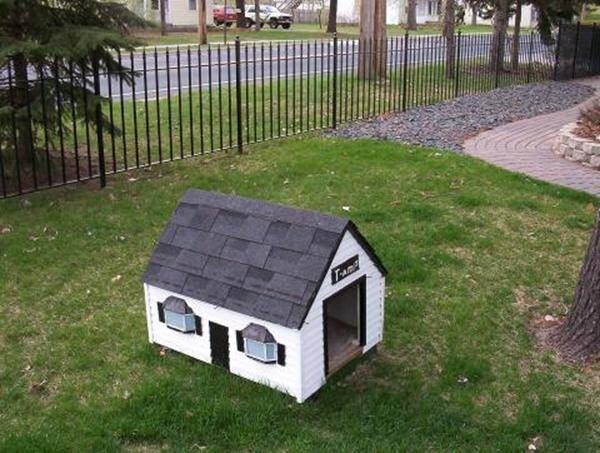 After the first two years of standing, the dog house was brought in for service. (These pictures were taken slightly before that time.) The structure was quite intact, the only portions that needed repair were due to implementation flaws. While the use of siding protected the wood, the bay windows weathered quite poorly; this was mainly due to not using exterior grade plywood. The 2 year maintenance work resulted in replacing the bay windows with exterior grade plywood. Additionally, some of the trim pieces had fallen off. The initial implementation used high temperature hot glue for attaching trim pieces; this did not weather well. At present, the replacement work used a combination of Gorilla glue and another glue that says that it is exterior grade, dries clear, and does not expand. The Gorilla glue was difficult to work with because it expanded 15% and dried yellow. If this other glue shows to hold up well when reviewed at the 4-year mark, I’ll exclusively switch to that glue. The dog house has entered into the realm of traditions with us. Each year it gets decorated with lights for Christmas. We are told that one neighbor’s children even believe that Snoopy lives there. While we have received positive comments from neighbors (and even people we don’t know passing by), our dog seems unimpressed with the dog house; he still prefers to crawl under the porch, and only quite rarely uses the dog house. (In 3 years, I’ve seen him in it only twice.) This last winter, I upgraded the structure to add a fabric door and a remote controlled light in order to make it heated; still, the dog didn’t really want to use it.